She learned it in how she talks about her skill and that of her teammates, and what makes her great. Watts cited everything but her ability—her coaches, her teammates, her practices. If you heard it from her, the best player in the entire country somehow can’t take any of the credit. Of course, therein lies the other half of the BC way—she was, in fact, the best player in the nation. Over the last five years, Katie Crowley’s crew has dominated Hockey East. 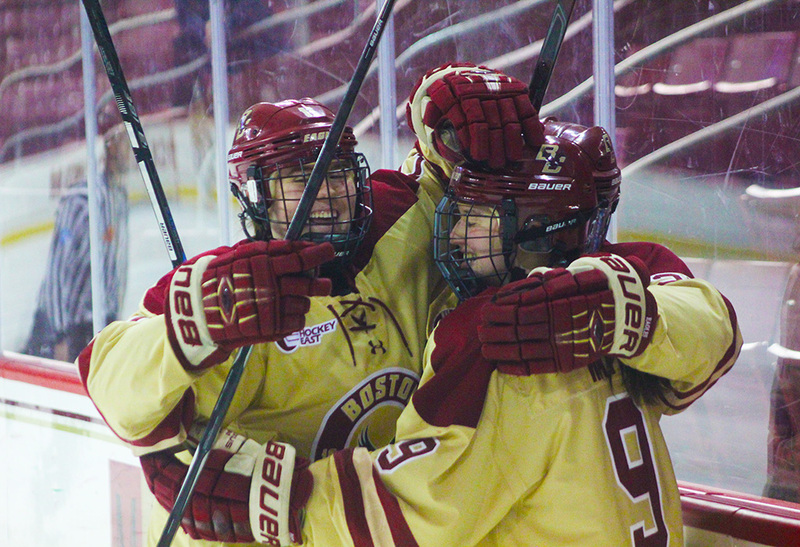 The program boasts all-time great Olympians like Haley Skarupa, Kelli Stack, and Alex Carpenter, who is BC’s all-time points leader and the winner of the 2016 Patty Kazmaier Award. And no player Crowley has had dominated the sport quite like Watts with the speed she did. Watts was the wire-to-wire points leader in the entire country—the only day she didn’t lead in scoring was the Eagles’ first game (one in which she had two assists, anyway). She corrected that the next day against Minnesota Duluth with a hat trick. At one point, she threatened to beat Carpenter and become BC”s single-season points leader. Carpenter notched those 88 points her senior year—by comparison, she had just 39 as a freshman. Watts was even on pace at one point to become just the fifth woman ever to surpass 100 points in a single season. That one will have to wait for next year. Watts settled for a “mere” 82 points—42 goals, 40 assists. That total made her the first underclassman to ever win the Patty Kazmaier Award for the nation’s best player. Forget breakout awards: Watts is undoubtedly The Heights’ 2018 Female Athlete of the Year. atts didn’t follow a typical path for a BC women’s hockey player, one that might come out of Buckingham Browne and Nichols, New Hampton, Noble and Greenough, or any of those fancy New England prep schools. She comes from north of the border, in a small neighborhood just outside Toronto, Ontario, where hockey rules supreme. Of course, even the sport’s birthplace hasn’t created equal opportunities for male and female players. Watts’s father, Michael, had to request for her to join her older brother’s house league team when she was 4—in part because there were no other options, but it didn’t hurt that it eased the minivan commutes back and forth from their house. From the moment she first laced up skates, people noticed her. Michael recalled a local hockey equipment store seeing her walk around in a couple of pairs. The manager, who had outfitted young players in Toronto for years, was stunned at the poise and steadiness she had on the blades. He immediately told Michael that his 4-year-old daughter would one day, at minimum, play at an NCAA level. Over time, Watts’s scoring output became unfair. In those youth leagues, she averaged almost three goals a game, her dad said. Michael said that the league had a limit to how often kids were allowed to score in the games. So Watts became good friends with her male teammates, because she could pad their stats—if they could catch up to her. “Daryl would skate to the end of the rink, and then she’d turn around, wait for the boys to catch up, and then she’d pick one and pass them the puck,” Michael said. Sensing that pure speed that Daryl had on the ice, she and Michael decided it was time to refine her ability with a skills coach who could teach her how to score from different angles, one-on-one strategies, how to approach defenses, and so on. They felt strongly enough in Daryl’s skill that they didn’t want to settle for second rate: they approached Dusan Kralik. A former Czechoslovakian junior player and one of the best hockey skills coaches in the country, Kralik was surprised at first. He worked with some of the best talents in Ontario, including Nashville Predators defenseman P.K. Subban and New York Islanders center John Tavares. The next day, Kralik saw Watts in a game, a girl playing with boys notching a hat trick, skating circles around them, without even looking like she’s trying. He knew he had the opportunity to add another special name to his long list of proteges. From then on, Watts would get up to meet with Kralik at 6:30 a.m., the only time they could make available, at least once a week through the rest of her time in Ontario, despite the fact that she didn’t even know what a slapshot was. Immediately, he could see that kind of fire that she had to be great. Kralik says Watts has a particular talent few have: she eliminates the competition. Not just by skating around them—anyone can do that. But the way she plays, he says, is light. Her vision on the ice pales in comparison to no female player he had ever seen. She has the unique ability to remove the goalie and players in front of her from her line of vision, Kralik says, to allow her to only envision how best to get to the net. In noting who else has that kind of ability, Kralik dropped the ultimate comparison. No pressure, just a link between her and the greatest hockey player who ever lived. ighth grade was the first time Watts transitioned to girls’ hockey. She played for the AA Saugabrays Peewee, where they won the provincial title and she got the Silver Stick Award for the league’s MVP. Eventually Watts joined the Mississauga Jr. Chiefs of the Provincial Women’s Hockey League. There, she continued her gaudy scoring—65 points in 34 games her first season, 52 in 31 games her second season. It was with Mississauga where she first caught the eye of Crowley and associate head coach Courtney Kennedy. Watts attended a summer tournament in Boston where the two coaches, who rarely scouted in Canada, got to see her play for the first time. It took just two shots on goal for them to extend a scholarship offer. Naturally, with all the success she had, Watts had her choice of schools. But she really wanted BC because there, she could learn from two women who had been in her skates who have competed for—and in Crowley’s case, won—women’s hockey’s ultimate goal: an Olympic goal medal. “There’s no other hockey school that gives you great coaches, a great city to live in, it’s one of the best universities in America,” Watts said. The Olympic connection is crucial, because that is Watts’s end game. She earned a spot on the Canadian U-18 National Team as a 16-year-old, competing for the two-time IIHF silver medalists. She even earned an invite to the fall festival for Team Canada’s national team where they would decide the roster for the 2018 Pyeongchang Winter Olympics. She quickly learned that the bid was to get her ready for the 2022 Winter Olympics—Canada’s roster was simply too backlogged with talent for the young Watts to find a spot. Maybe that’s something Team Canada regrets. Because, while Canada stayed pat with its older players, the United States picked apart BC’s defense—seniors Kali Flanagan and Megan Keller, and incoming freshman Cayla Barnes—for its roster. That team was good enough to lift the Americans to a shootout gold medal victory over Canada, the first since the U.S. team Crowley was on won gold in the inaugural matchup in 1998. Watts is just grateful for the experience to get that close, because it made coming to college level and joining a roster that included stars like Makenna Newkirk and Caitrin Lonergan, both of whom were top 10 in points, much easier. “I’ve now played with the best players in Canada, so that helped me be not crazy intimidated by these amazing BC players that I’d heard about,” Watts said. She was most excited about meeting her hero: Marie-Philip Poulin. The fact that Poulin is Watts’s favorite player shouldn’t be a surprise. She is to Canadian women’s hockey what Mike Eruzione was to that legendary 1980 United States Olympic gold medal-winning team—just two times over. Poulin scored both goals in Canada’s 2-0 victory over the U.S. in the 2010 Vancouver Winter Olympics gold medal game, as well as the game-tying and go-ahead goals against the United States in Canada’s 3-2 gold medal victory at the 2014 Sochi Winter Olympics. The only problem, of course—as I reminded Watts—is that Poulin played her college games down Commonwealth Ave. at Boston University. Idolizing a Terrier? Okay, so maybe Watts hasn’t mastered the BC way quite yet off the ice. But as a freshman who’s already the sport’s best college player, it’s hard to argue that she won’t have time to get that part settled on her path to leading BC to a national title.